France is a developed country with the sixth-largest economy in the world. France is the most visited country in the world, receiving over 79 million foreign tourists annually. 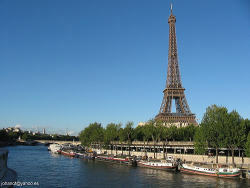 Paris, the city of light and its surroundings are one of the most visited areas. Paris is without a doubt one of the most beautiful cities on the planet. France is a developed and stable democracy with a modern economy. It has substantial agricultural resources, a large industrial base, and a highly skilled work force. France scores well in business freedom, property rights, freedom from corruption, and monetary freedom. Although ultimately a victor in World Wars I and II, France suffered extensive losses in its empire, wealth, manpower, and rank as a dominant nation-state. Nevertheless, France today is one of the most modern countries in the world and is a leader among European nations. Since 1958, it has constructed a presidential democracy resistant to the instabilities experienced in earlier parliamentary democracies. In recent years, its reconciliation and cooperation with Germany have proved central to the economic integration of Europe, including the introduction of a common exchange currency, the Euro, in January 1999. At present, France is at the forefront of efforts to develop the EU’s military capabilities to supplement progress toward an EU foreign policy. France is in the midst of transition from a well-to-do modern economy that has featured extensive government ownership and intervention to one that relies more on market mechanisms. The government has partially or fully privatized many large companies, banks, and insurers, and has ceded stakes in such leading firms as Air France, France Telecom, Renault, and Thales. It maintains a strong presence in some sectors, particularly power, public transport, and defense industries. The telecommunications sector is gradually being opened to competition. France’s leaders remain committed to a capitalism in which they maintain social equity by means of laws, tax policies, and social spending that reduce income disparity and the impact of free markets on public health and welfare. The tax burden remains one of the highest in Europe (nearly 50% of GDP in 2005). With at least 75 million foreign tourists per year, France is the most visited country in the world and maintains the third largest income in the world from tourism. While Metropolitan France is located in Western Europe, France also has a number of territories in North America, the Caribbean, South America, the southern Indian Ocean, the Pacific Ocean, and Antarctica. France possesses a wide variety of landscapes, from coastal plains in the north and west to mountain ranges of the Alps in the south-east, the Massif Central in the south-central and Pyrenees in the south-west. At 4,807 meters above sea-level, the highest point in western Europe, Mont Blanc, is situated in the Alps on the border between France and Italy. France also has extensive river systems such as the Loire, the Garonne, the Seine and the Rhône, which divides the Massif Central from the Alps and flows into the Mediterranean Sea at the Camargue, the lowest point in France. Corsica lies off the Mediterranean coast. The north and northwest have a temperate climate, however, a combination of maritime influences, latitude and altitude produce a varied climate in the rest of Metropolitan France. In the south-east a Mediterranean climate prevails. In the west, the climate is predominantly oceanic with a high level of rainfall, mild winters and cool summers. Inland the climate becomes more continental with hot, stormy summers, colder winters and less rain. The climate of the Alps and other mountainous regions are mainly alpine in nature with the number of days with temperatures below freezing over 150 per year and snowcover lasting for up to six months. The culture of France is very rich and diverse, reflecting regional differences as well as the influence of immigration. France plays since centuries an important worldwide role as a cultural center, with Paris as a world center of high culture. In the 18th century, French became the literary lingua franca and diplomatic language of western Europe (and, to a certain degree, in America), and French letters have had a profound impact on all European and American literary traditions while at the same time being heavily influenced by these other national traditions. France, especially Paris, has long been a gathering spot for artists from across Europe and the World. French authors, actors, musicians and artists are not only worldwide famous, but they have also deeply influenced the European culture over the centuries. Primary and secondary education is predominantly public while tertiary education has both public and private elements. The teachers in public primary and secondary schools are all state civil servants, making the ministère the largest employer in the country. Professors and researchers in France’s universities are also employed by the state. Schooling in France is required and mandatory as of age 6, the first year of primary school. Many parents start sending their children earlier though. Religious instruction is not supplied by public schools. Laïcité (secularism) is one of the main precepts of the French republic. Pupils therefore have civics courses to teach them about la République, its function, its organization, and its famous motto Liberté, égalité, fraternité (Freedom, equality, brotherhood). The baccalauréat (also known as bac) is the end-of-lycée diploma students sit for in order to enter university, a classe préparatoire, or professional life. The term baccalauréat refers to the diploma and the examinations themselves. It is comparable to British A-Levels, American SATs or ACTs, the Irish Leaving Certificate, Australia’s Higher School Certificate and the German Abitur. A striking trait of French higher education, compared with other countries, is the small size and multiplicity of establishments, each specialized in a more or less broad spectrum of disciplines. A middle-sized French city, such as Grenoble or Nancy, may have 2 or 3 universities (for instance: science / sociological studies), and also a number of engineering and other specialized higher education establishments. For instance, in Paris and suburbs, there are 13 universities, none of which are specialized in one area or another, and a large number of smaller institutions which are very specialized. It is not uncommon for graduate teaching programs (master’s degrees, the course part of PhD programs etc.) to be operated in common by several institutions, allowing the institutions to present a larger variety of courses. In engineering schools such as École polytechnique, it is not uncommon that a large share of the teaching staff is not made up of permanent professors, but of part-time professors hired to teach one specific point only. These part-time professors are generally hired from neighboring universities, research institutes, or industry. Another originality of the French higher education system is that a large share of the scientific research is not done by universities, but by research establishments such as CNRS or INSERM. In many cases, the research units of those establishments are installed inside universities (or other higher education establishments), and jointly operated by the research establishment and the university. It is also fairly common that research staff teach some graduate classes. However, this research staff will not be counted as part of the normal academic staff of the university. Another characteristic is the low tuition costs. Since higher education is funded by the state, the fees are very low: the tuition varies from 150 € to 700 € depending on the university and the different levels of education (licence, master, doctorat). One can therefore get a Master’s degree (in 5 years) for about 750-3,500 €. Additionally, students from low-income families can apply for scholarships, paying nominal sums for tuition or textbooks, and even getting a monthly stipend. The tuition in public engineering schools is comparable to universities, albeit a little higher (around 700€). However it can reach 7000 € a year for private engineering schools, and some business schools, which are all private or partially private, charge up to 12000€ a year. Health insurance for students is free (if they get a scholarship) until the age of 25, so only the living costs and books expenses have to be added. The public universities in France are named after the big cities near which they are located, followed by a number if there are several. Paris, for example, has thirteen universities, labeled Paris I to XIII, most of them are however not in Paris itself, but in the suburbs. In addition, most of the universities have taken a more informal name which is usually the one of a personality or a particular place. Sometimes, it is also a way to honor a famous alumnus. For example, the science university in Strasbourg is known as “Université Louis Pasteur” while its official name is “Université Strasbourg I”. The French system is currently undergoing a reform, the Bologna process, which aims at creating European standards for University studies, most notably a similar time-frame everywhere, with three years devoted to the Bachelor’s degree (licence in French), two for the Master’s, and three for the doctorate. French universities have also adopted the ECTS credit system (for example a licence is worth 180 credits). However, the traditional curricula based on end of semester examinations still remains in place in most universities. This double standard has added complexity to a system which also remains quite rigid. It is for example difficult to change a major during undergaduate studies without losing a semester or even a whole year. Students usually also have few course selection options once they enroll in a particular diploma. The Grandes écoles of France are higher education establishments outside the mainstream framework of the public universities. They are generally focused on a single subject area, such as engineering or business, have a moderate size, and are often quite selective in their admission of students. They are widely regarded as prestigious, and traditionally have produced most of France’s scientists and executives. The amount of work required of the students is exceptionally high. In addition to class time and homework, students spend several hours each week completing exams and ‘colles’. The so called ‘colles’ are unique to French academic education in CPGEs. They consist of oral examinations twice a week, in math, physics, French and the foreign languages, usually English and Spanish. Students, usually in groups of three, spend an hour facing a professor alone in a room, answering questions and solving problems.